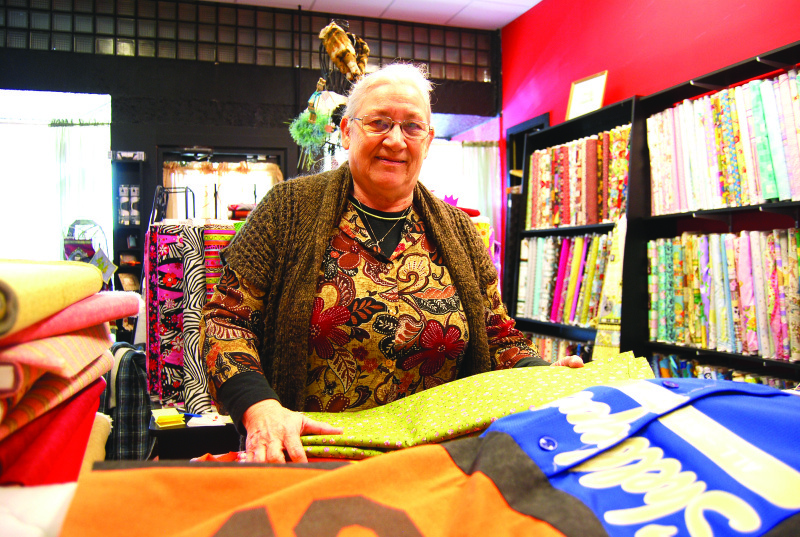 Fredia Haley, owner of Treasure Chest Antiques and Quilts, opened her business on the east side of the Woodbury square in late 2014 as an antique shop, but several months later transformed it into a quilting haven. Today she says, "Why did I wait so long? Fredia Haley's quilt shop has a full line of quilting and embroidery needs. She also offers long arm quilting, embroidery services, light alterations and night quilting classes. The shop nestles on the east side of the Woodbury square at 111 N. Cannon St. 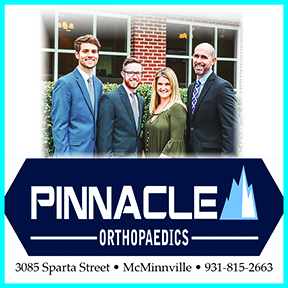 Hours are 10 a.m.-6 p.m. Monday, Tuesday, Thursday, Friday and 10 a.m.-3 p.m. Saturday. Phone: (615) 563-1484. Fredia Haley's busy-as-a-bee Treasure Chest Antiques and Quilts shop on the east side of the Woodbury square boasts two small businesses in one, but please note the emphasis on the last words of her enterprise: AND QUILTS. "After I retired I was about going crazy at home. I needed fellowship, interacting with people," said Haley, who lives in Murfreesboro and worked 22 years as a supervisor at Bridgestone. "I had gotten me a booth in the Iron Pig to sell antiques that I needed to get rid of, and I had a booth upstairs. The wonderful ladies there said, 'You got so much stuff, you need to go and rent that building up the street.' I ended up buying the building and didn't have to walk up and down stairs as much." The industrious Haley opened her Treasure Chest Antiques in November 2013. While sitting in her shop, she realized she had no Christmas gifts for her grandkids. So she toted her sewing machine to Woodbury and went to it. "People came in and saw me at work, and there was such a response to the sewing that it took over. So I brought my fabric from home, patterns and this and that. In March 2014 I knocked a hole in the wall here and extended my business. It turned from an antique shop into a quilt store. Now it's more about the quilts," she said. "I have over 1,400 bolts of fabric and have all sorts of quilting accessory, supplies and patterns. I also offer a long arm quilting services do long arm quilting." On a sunny afternoon in mid-February, half a dozen customers enter within a span of 60 minutes. Some are friends. Some are strangers. But with sewing and quilting as the center of conversation, all are pals before they depart. "It dawned on me one day that I should have named this The Gathering Place because this has become a place where quilters meet and make friends," said Haley, a native of Manchester. "Now I ask myself, 'Why did I wait so long?' I'm having a ball. This is my hospital, my doctor's office. I don't go to the doctor anymore. It controls my blood pressure. This is my happy house." Joining Haley around a table covered with colorful fabric this afternoon are Retha Johns and Maybelle Basham of Murfreesboro and Joann Bush of Woodbury. Says Basham, "I started coming here before Christmas. My granddaughter saved over 40 T-shirts while she was in college. I pieced it and Fredia quilted it." Johns makes quilts and throws, often as gifts for family and friends. Today she picked up two pieces of material, one covered with Mickey Mouses and the other with Mickey's girlfriend Minnie Mouse. Cannon Countian Bush said, "I've been coming since she opened her store. I've found a top she's going to quilt and bind for me. She has a quilting machine. She has everything it takes to put the quilt together. "She has really added to her merchandise and material since she opened. It's really handy because I had to go to McMinnville." Haley tells her, "Any of these pieces we have here we can put on the back and piece it. All my quilts have real vivid backs to them." Courtney Boyd of Woodbury walks in later. This is her first visit. "I'm a beginner. I haven't even made a quilt yet," Boyd confessed. "My cousin gave me a list. I'm here to fill it. I found this place on Facebook, word of mouth, everybody bragging. For a small town, it's very well stocked." Haley eases Boyd's fear of sewing and tells her, "Honey, it's just a machine. If you can keep your finger away from the needle, it's going to be OK."
"I always enjoy it when the ladies come in," says the quilting queen. "Some customers buy fabric and patterns. Some may not know to start. I'll send them along into it. "They make the top at home or have one that somebody gave them. They don't know how to do it or don't have a machine at home. They'll bring it to me and I'll quilt and put the backing on. We just do a lot of different things here. If you take the class, I can promise you one thing, you're gonna have fun." Haley's shop takes two slots on the square. Each room is 16X70 feet, thus she offers 2,200-square feet of quilting heaven. The Woodbury sewing circle was in recently, and local guilds often visit. She has had customers drop by from Pikeville, Spencer, Manchester, Rock Island, McMinnville, Nashville, Murfreesboro and Smyrna. On her quilting machine in a back room she has completed 16 quilts since Christmas. "I can do one a day. When I get into a quilt I can't quit till I fall over or it's finished," she says. "I got so much started. You never get bored with it." The mother of two and grandmother of four began sewing at the age of 7 and learned on a treadle sewing machine. "Mama quilted all my life. She taught me how to sew, and boy, making your own clothes helps. People gave us scraps, and whenever someone would get married in the neighborhood, Mama would give them a quilt," she recalled. "I began quilting 15 years ago. I really didn't get into it heavily until seven years ago, and then I went from sewing to quilt making." The proprietor of Treasure Chest Antiques and Quilts concludes, "I came up here one day to visit the antique shops. Woodbury is a very cute little place. You never know what to expect. It's something different all the time. It's just hometown, I love it."